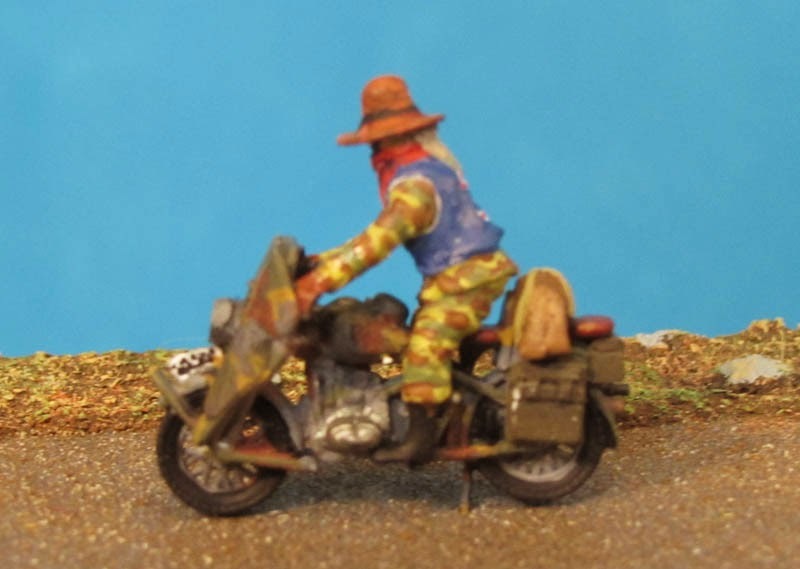 Here I show my first conversion on a Stalker in 1/72 scale.Basic had been a Cowboy figure with jacket. All details what bothered me, had been sandpared. Than starting to sculpt the new items. First the sleeves of the jacket constructzed up with a little more volume. Than the belt of the backpack. 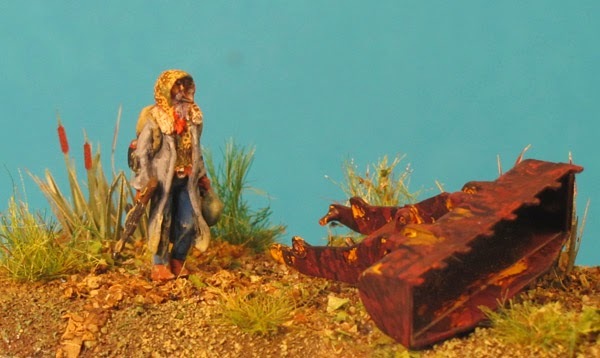 I take a bearded head from one of my pirates, full him with a hood, which is typical of the appearance of the Stalker. Given a new right Hand with automatic rifle and a new left hand get a baggage, sculpted from Magic sculpt. The backpack too is sculpted from Magic Sculpt. When all is dry, I smoothen the surface, give the figure a primer and start painting. placed the finbished figure on a base which had been ready for some time. 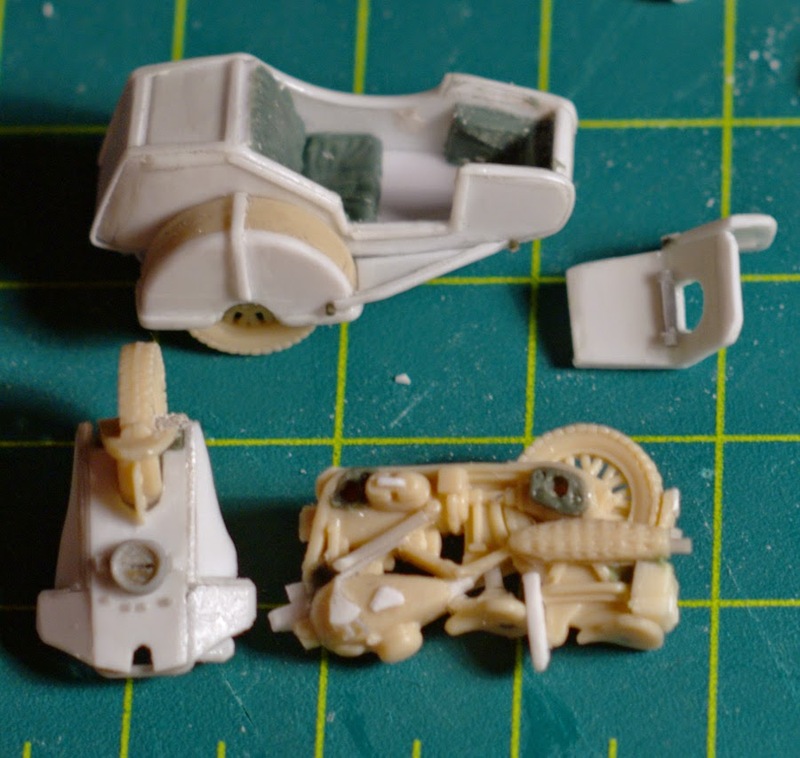 Add part of a wheel loader, painted totally rusted. 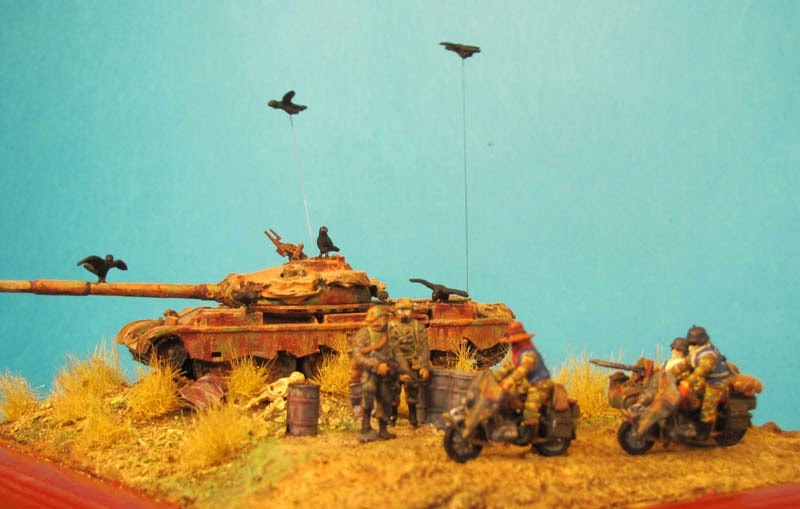 Now this little scene wait for the next conversion from me . 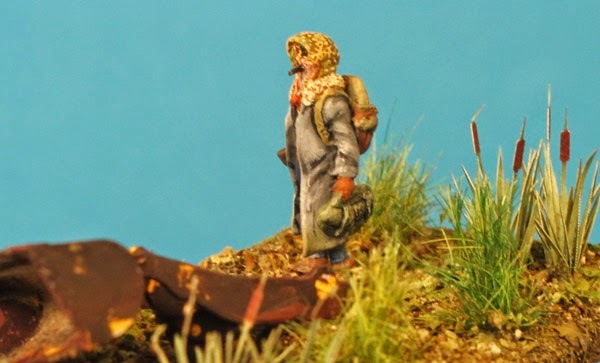 Today I manage finishing painting of the first figure in our range PAW (Post Apocalyptic World) from Germania Figuren® . 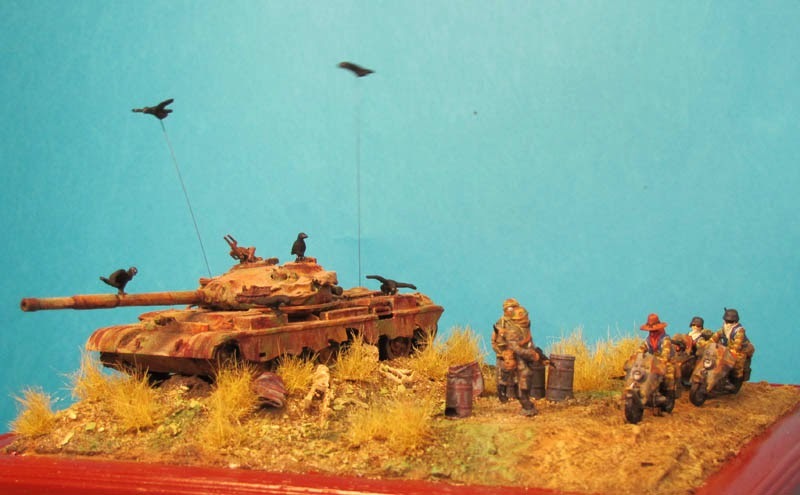 Make the picture for the production label and than directly glue this into the diorama. 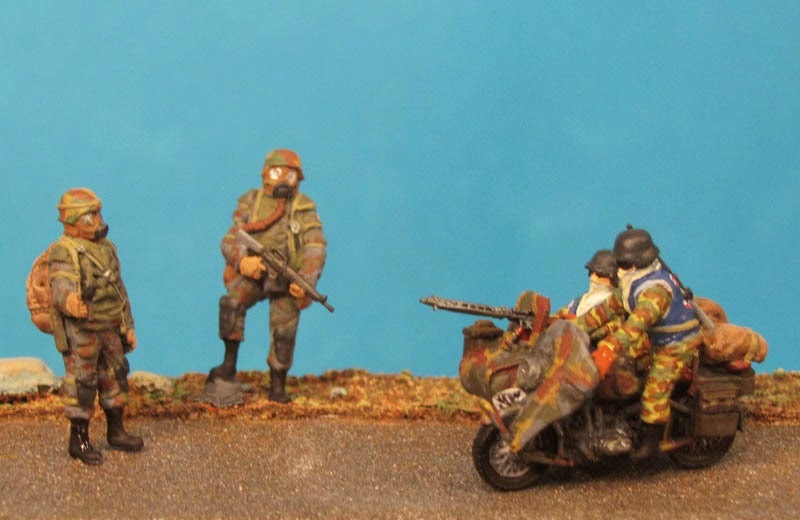 Two Mercenarie and a motorcycle with sidecar and 2 Rocker Members. I directly convert one motorcycle and its rider into the boss of the gang. And you see the new figure glued into the Diorama. 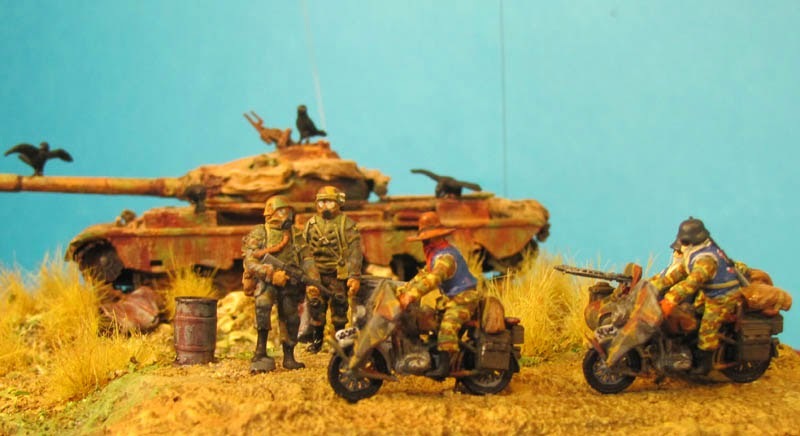 Nowe time to look which details could be add to give more realism to the project, and also looking if some more figure would fit, or overload the diorama. 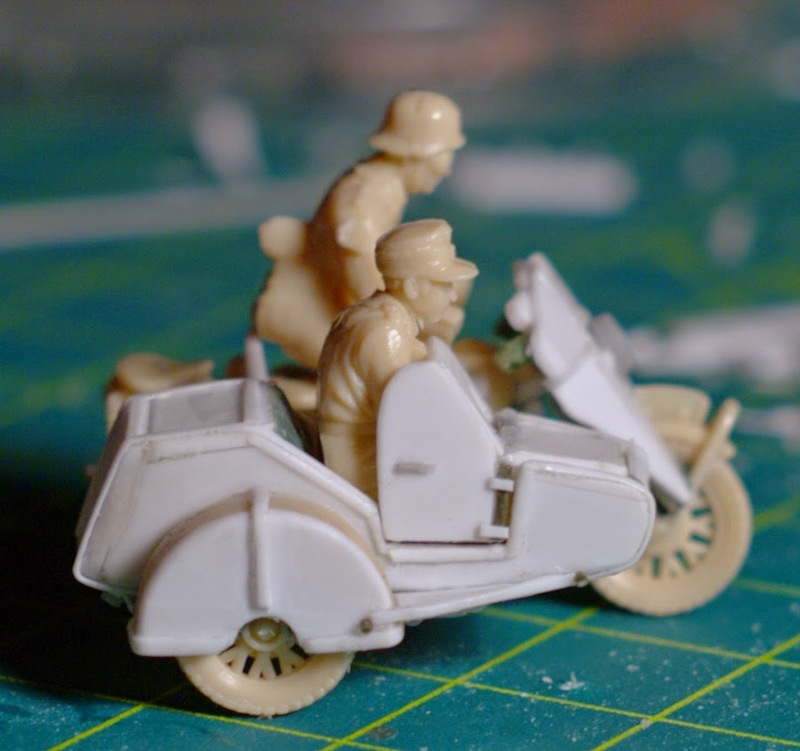 The figure go now into production and will be available from Germania Figuren® at the end of April. Hope you enjoy this little project and have some new idea out of the PAW. 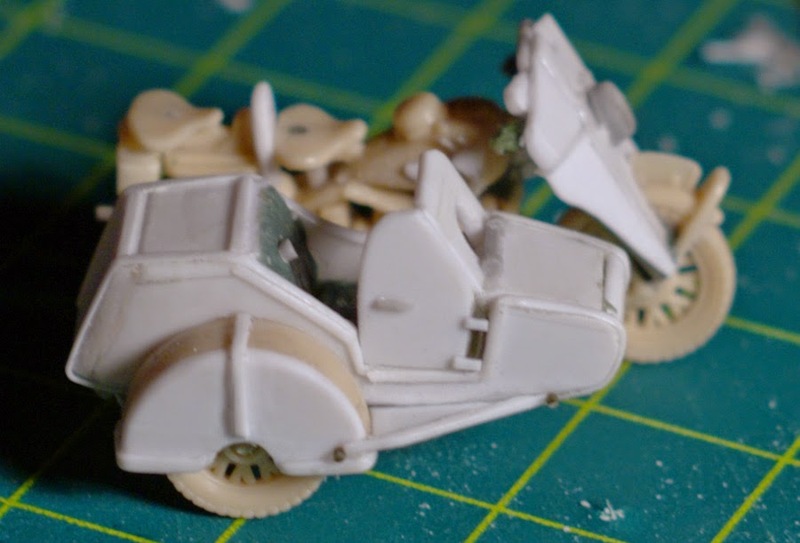 The sculpting of our first set of figures and vehicle in the Post Apocalyptic World is finished and is on the way for mould making. After the test casting, painting and printing the label - so in march the set will be available. 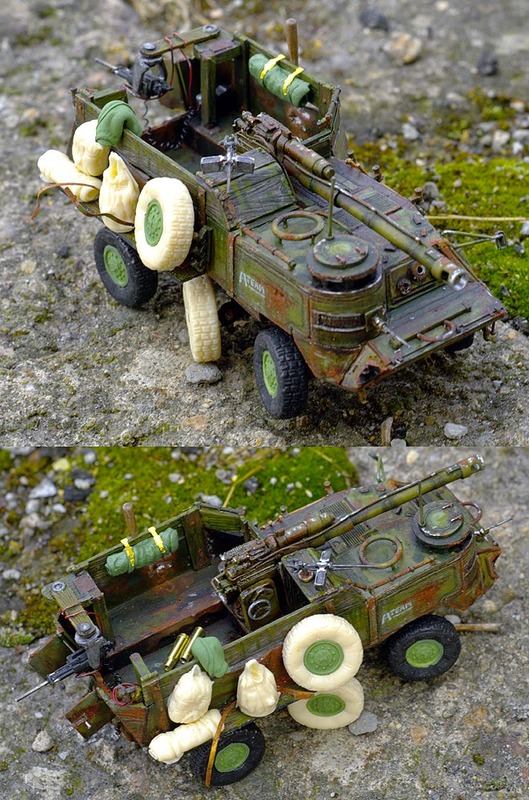 Here is an example of ingenuity guerrillas in a dangerous post apocalyptic world. To survive stalkers, gather every possible equipment to defend and attack. 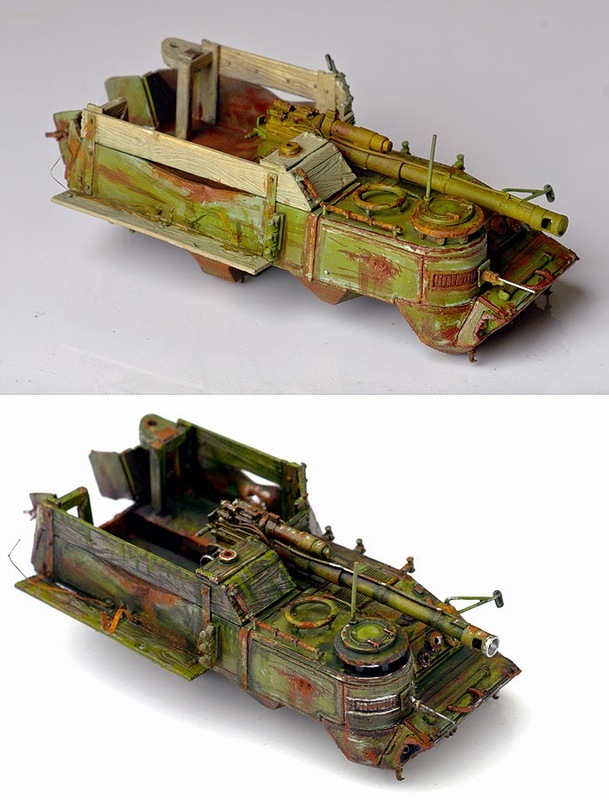 So has just created the "A-Team transporter", was created by the German carrier TPZ 1 "Fuchs" A4, cannon found on the battlefield and sheets, planks and other useful things. The vehicle is extremely maneuverable and has many useful features, and is very durable. 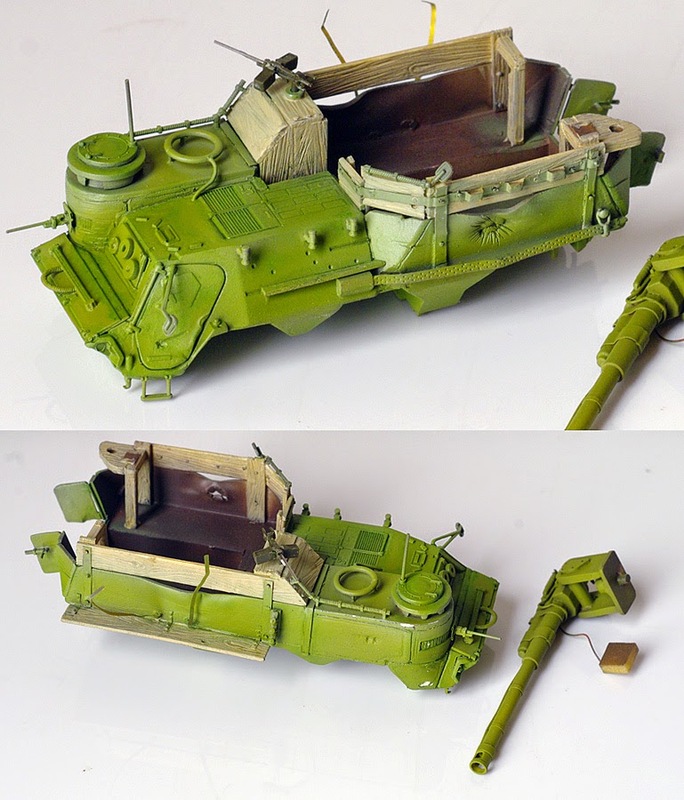 The tutorial will show you how to build such a vehicle in 1:72 scale yourself step by step! after drying paint, scratches and abrasions made. The place where they will be scratching gently softens thiner, or water with alcohol. Then I removed the green paint and a toothpick stiff brush. In this way, the resulting scratches. Then I make a brush with rust stains and dirt. in places where there is rust, stains doing paint mixed with pigment. with dirt stains doing black and brown enamel thinned enamel solvent. 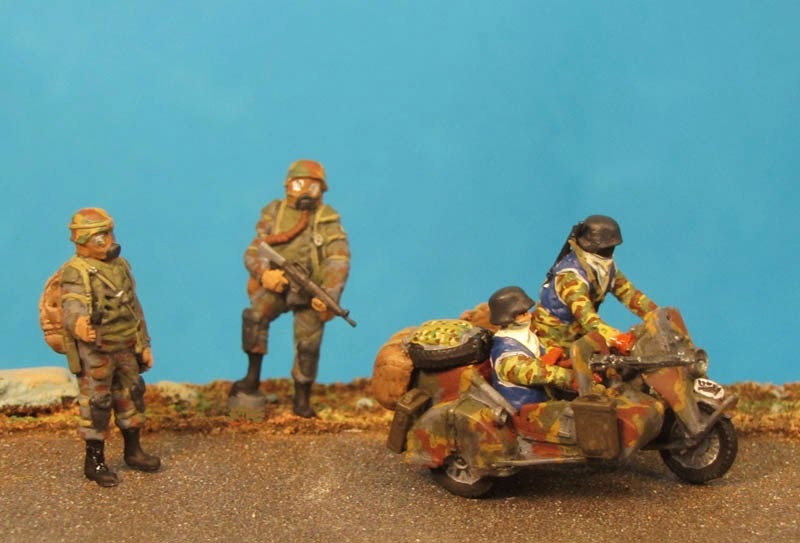 made of polyurethane resin new tires, rucksacks and equipment. 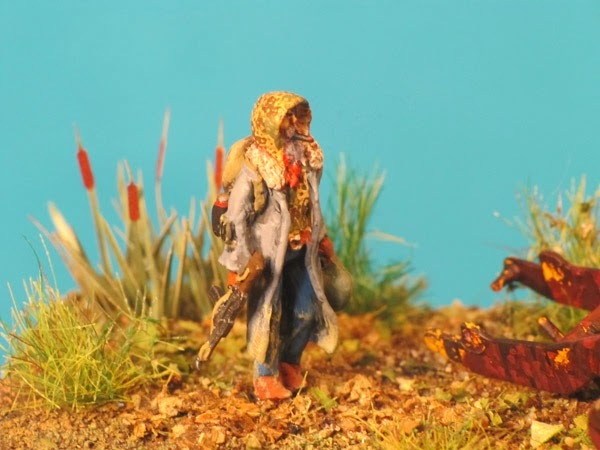 - The land is made by covering the area with wood glue and sprinkle dirty sand mixed with pigment. The whole land protected liquid primer (unigrunt). 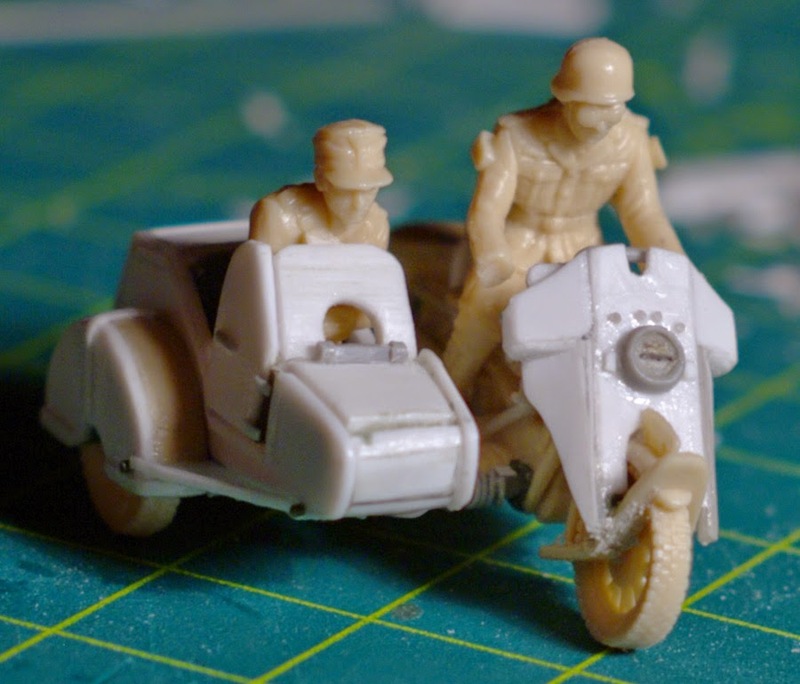 The motorcycle and the figure are still in sculpting progress , so I start the little Dio which later will show this first set of Germania Figuren® in the Postapocalyptic Area. 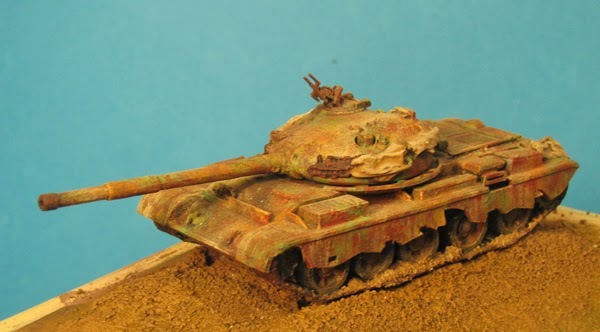 In my stock had been a long time ago build T 62 aqnd I decide to make some battle demage on this old model and paint it with several layers of rust. 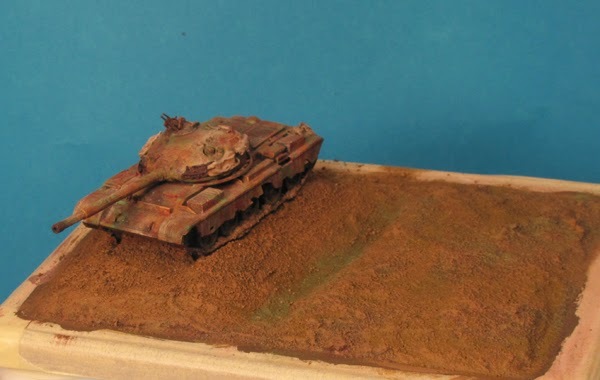 The diorama had first been for another project, so I later have to modify the ground, so the tracks are real pressed into the ground. Also waiting for a Skeleton from my friend Erik Trauner, which will be next the tank. The depression will be filled with water from Vallejo, coulored as chemical contaminated water. On the other side of the depression is the meeting of 2 members of Hell Angel with some Mercenaries. 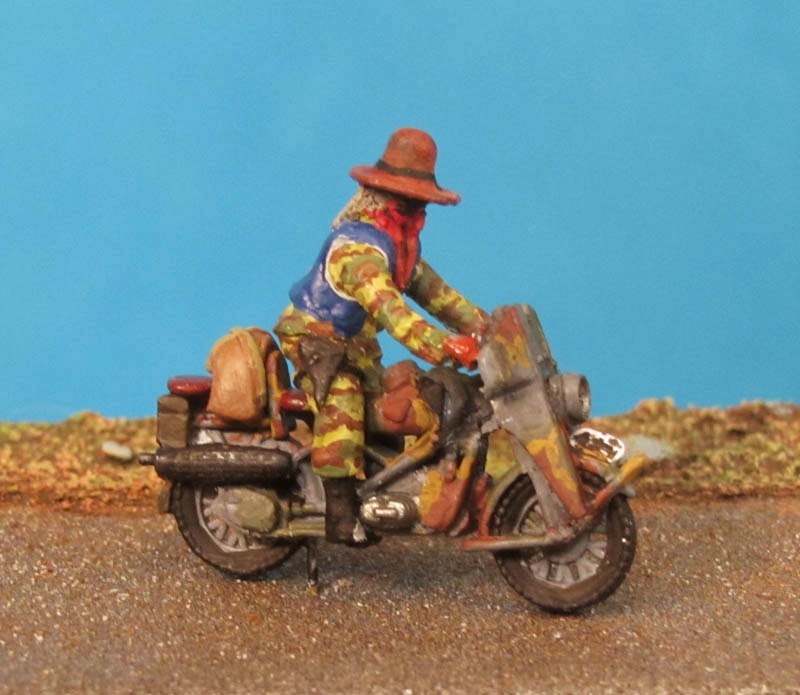 Our first project in modelling the world of the Postapocalypse is a motorcycle with sidecar, driven by some Rocker, Hells Angels, Bandidos etc. and a Checkpoint manned by 2 mercenaries. 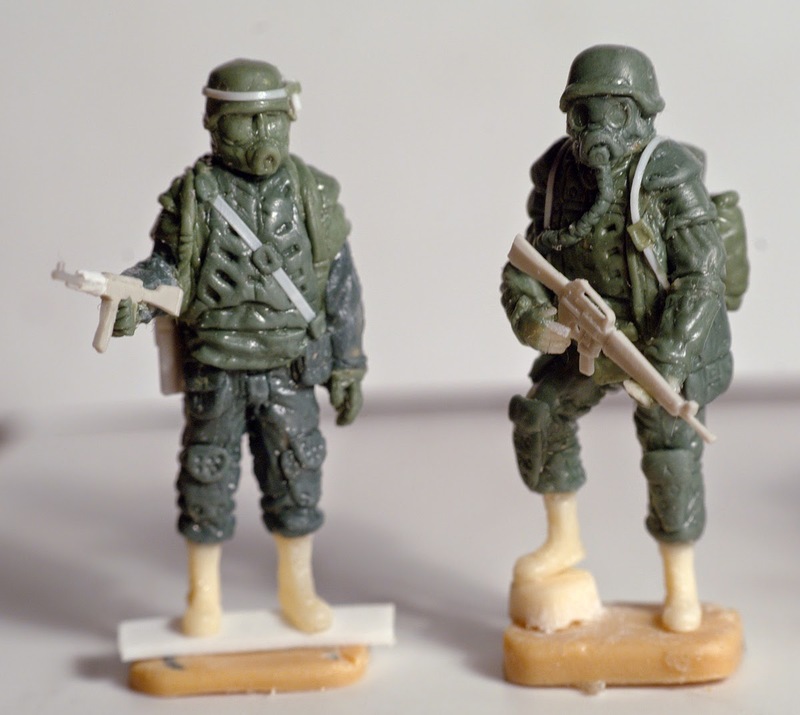 For showing the size we add only 2 figure of soldier WW II. later this will be replaced by 2 Rocker. More picture when the next step is ready.